Robert Briggs salvaged a point for South Shields with a dramatic stoppage time penalty as Basford United were denied victory at the death at Mariners Park on Saturday. Briggs converted from the spot seven minutes into added time as Shields snatched a 1-1 draw which left them three points behind Evo-Stik Premier Division leaders Farsley Celtic. The Mariners had not been at their best – Basford hit the woodwork three times in the first half – but showed character in abundance to continue battling and eventually secure a point which could yet prove crucial. A bitter and at times strong wind made life difficult for both teams but it was Basford who started the strongest, and they almost went in front as early as the second minute. Lewis Carr advanced down the left flank and sent in a cross which was caught by the wind and struck the top of the crossbar as Shields breathed a sigh of relief. There was another close shave for the Mariners soon after when Jack Thomas went on an impressive run down the right and sent in a delivery which was met by the head of Henri Wilder before a deflection sent it wide. Shields eventually played themselves into some rhythm as they showed glimpses of the form which had seen them secure six successive victories, and almost opened the scoring when Robert Briggs played in Luke Daly and his goalbound effort was brilliantly saved by the outstretched foot of Basford goalkeeper Kieran Preston. The visitors’ response was strong, and they had a golden chance to take the lead as Nathan Watson received the ball on the right and sent in a superb cross for Matt Thornhill, but he sent his effort away from goal from eight yards. Basford hit the bar again when Thomas came inside from the right and dinked an effort which beat Liam Connell but did not have enough dip on it to drop below the crossbar. Daly provided Shields’ biggest spark and he again tested Preston with a low drive which the goalkeeper pushed behind for a corner. Basford continued to give as good as they got, though, and they were left scratching their heads as to how they did not go in front on the stroke of half-time. Thornhill’s header from a Ryan Wilson free-kick was destined for the net before Connell pulled off a miraculous save and the rebound then struck the crossbar before being hacked off the line. Shields will have been eager to make a better impression after half-time and they did that with a bright 10 minute spell. They began to pepper the Basford goal with shots, with Nathan Lowe shooting over three times from distance before Briggs aimed for the spectacular with an effort from 10 yards inside his own half which Preston scrambled to save. Connell still had to be alert at the other end, though, and kept out a shot from Thornhill after a Basford counter-attack. The hosts were stunned on the hour mark as Basford took the lead. A free-kick was launched into the Shields box and after a spot of pinball, Carr fired the ball home with a low effort. Shields had half an hour to rescue something from the game but found clear-cut chances difficult to come by. Craig Baxter and Lowe had shots saved, while at the other end, Connell made a stunning one-handed stop to keep out a piledriver from Thomas. The Mariners built up some momentum in the latter stages and substitute Ben Harmison had a good chance to bring them level with four minutes left, but headed wide at the back post. Jon Shaw – pushed up-front in stoppage time – smashed two efforts not far off target before the key moment arrived four minutes into stoppage time when another Shaw shot was cleared off the line by the hand of Basford defender Wilson, who was shown a straight red card by the referee. What followed was a three-minute delay which saw Wilson delay his exit from the field while a team-mate kicked away the penalty spot marking, before a scuffle delayed the spot-kick further. The coolest man in the ground was Briggs, though, as he stepped up to smash the penalty into the top corner with just about the last kick of the game. It was his 18th goal of the season and could yet prove to be the most important. With three league games remaining, it’s still all to play for. 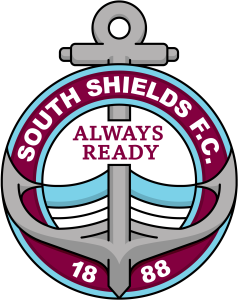 SOUTH SHIELDS: Connell, Baxter, Adams, Shaw (c), Morse, Turnbull (Harmison 76), Daly, Briggs, Mason (Cogdon 61), Lowe, Bell (Foley 61). Subs not used: Lough, Mouanda.